What do you do to protect your ‘Privacy’ and keep yourself safe from potential hackers? Well, Facebook CEO Mark Zuckerberg just need a bit of tape to cover his laptop webcam and mic jack in order to protect his privacy. Yes, Zuck also does the same as the FBI Director James Comey. 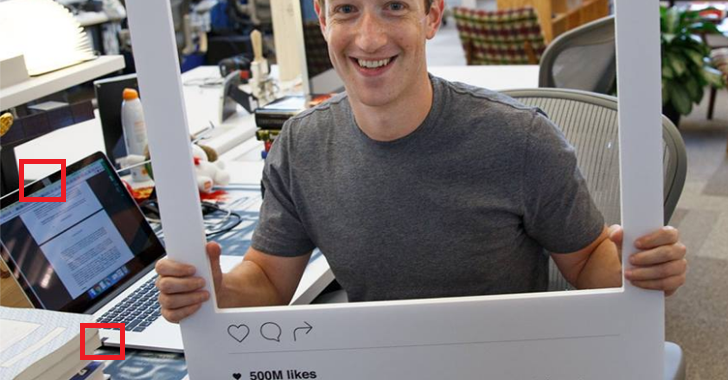 Zuckerberg posted a photo on Tuesday to celebrate Instagram’s 500 Million monthly user milestone, but the picture end up revealing about another security measure he takes to ensure that nobody is spying on him – and it’s surprisingly simple. Some eagle-eyed observers quickly noticed that the MacBook Pro on Zuckerberg’s desk in the background of the image has the tape covering not only the webcam, but also the laptop’s dual microphones. While some tried to argue that it was not Zuckerberg’s desk, Gizmodo pointed out that Zuckerberg has posted videos, live streams and images from there before, so it seems like a safe assumption. So, Zuckerberg joins FBI director James Comey and NSA whistleblower Edward Snowden, who admitted that they tape their webcams. Although some called this move paranoid, taping up your webcam is a simple and excellent precaution that cost nothing and has appeared many times in the past. Keeping aside the controversies over Zuck’s move, tapping your laptop’s webcam is a good take away for you to adopt, because we know the ability of spy agencies, including the FBI and NSA (National Security Agency), to turn on webcam to spy on targets. Edward Snowden leaks revealed Optic Nerve – the NSA’s project to capture webcam images every five minutes from random Yahoo users. In just 6 months, 1.8 Million users’ images were captured and stored on the government servers in 2008. However, putting a tape over your webcam would not stop hackers or government spying agencies from recording your voice, but, at least, this would prevent them watching or capturing your live visual feeds.